Journal of Clinical Medicine and Therapeutics is a scholarly research journal that reports an ample scope for the researchers, scientists, pioneers and common readers of the globe. In order to gain more information about the recent advancements or developments in the field of medical research specifically Clinical Medicine and Therapies, which directly impacts on the treatment and care of the patients. 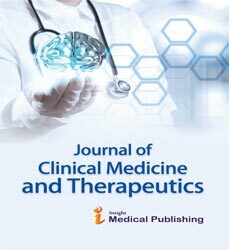 Journal of Clinical Medicine & Therapeutics is an open access journal that thrives to provide genuine and reliable complete source of data of current research on medicine and therapeutics. This scholarly journal is using Editorial Manager® System for online manuscript submissions, review and tracking. Editorial board members of Journal of Clinical Medicine & Therapeutics are active and rapid in assigning minimum two independent reviewer’s, on approval followed by the editors decision. Health-care professionals who treat and observe patients, such as doctors, nurse practitioners and physician assistants, are often called clinicians. Clinicians are expected to act ethically, legally and morally for the benefit of their patients. All clinicians have a responsibility to perform complete physical assessments; order appropriate laboratory or other diagnostic work; and document their findings and plan of care. Clinicians are expected to follow the accepted medical standard of care, a clinical benchmark that indicates what a reasonable and prudent person would do in a particular situation to provide quality medical care. The acceptable standard of care was once limited to community medical practice but now typically applied on a national basis. Forensic medicine is the medical specialty which interfaces with the law. This umbrella term covers the doctors who undertake medico-legal investigation of death, who are forensic pathologists and those who assess the living in the investigation of interpersonal injury, fitness for interview by police, fitness to drive and other matters that require some understanding of pharmacology, custodial and traffic medicine and criminology. Journal of Clinical Medicine and Therapeutics, Journal of Forensic Medicine, Journal of Forensic Biomechanics, Journal of Forensic Psychology, Journal of Clinical Forensic Medicine, The American Journal of Forensic Medicine and Pathology. A laboratory information system (LIS) is a software system that records, manages, and stores data for clinical laboratories. The Laboratory Information Systems Division (LIS) section is responsible for the implementation, education, support, and maintenance of the Medical Information Technology Laboratory Information System (Meditech LIS) with integration into the Health Information Systems infrastructure and Electronic Medical Records (EMR) system. Laboratory Information Systems provide modules for sending laboratory tests order to the instruments through its multiple instrument interfaces, some are known as to have as many as five hundred, track those orders and then capturing the results as soon as they become available. The result can then be analyzed and a report the generated from it. Laboratory Information Systems communicate with other information systems using clinical information standard such as HL7. Laboratory systems might also make use of LONIC (Laboratory Observation Identities, Names and Codes) to exchange laboratory results with other systems. Journal of Clinical Medicine and Therapeutics, Journal of Clinical Chemistry and Laboratory Medicine, Medical Safety & Global Health, Chemometrics and Intelligent Laboratory Systems, American Journal of Clinical Pathology, International Journal of Health Care Quality Assurance. “Clinical practice guidelines are systematically developed statements to assist practitioner and patient decisions about appropriate health care for specific clinical circumstances.” (Institute of Medicine, 1990). Modern clinical guidelines identify, summarize and evaluate the highest quality evidence and most current data about prevention, diagnosis, and prognosis, therapy including dosage of medications, risk/benefit and cost-effectiveness. Additional objectives of clinical guidelines are to standardize medical care, to raise quality of care, to reduce several kinds of risk (to the patient, to the healthcare provider, to medical insurers and health plans) and to achieve the best balance between cost and medical parameters such as effectiveness, specificity, sensitivity, resoluteness, etc. Journal of Clinical Medicine and Therapeutics, Journal of Clinical Chemistry and Laboratory Medicine, Medical Safety & Global Health, Chemometrics and Intelligent Laboratory Systems, International Journal of Clinical Practice, Clinical Practice Guidelines : Journal of Neurologic Physical Therapy. Clinical Therapeutics is dedicated to the dissemination of reliable and evolving evidence derived from clinical pharmacology and other therapeutic approaches to an international audience of scientists and clinicians working in a variety of research, academic, and clinical practice settings. Providing such information is especially important in this era of harmonization and globalization of drug development. Clinical Therapeutics also understands the importance of strengthening the body of evidence surrounding particular agents through the publication of replication studies, negative trials, and failed trials. A communicable disease is one that is spread from one person to another through a variety of ways that include: contact with blood and bodily fluids; breathing in an airborne virus; or by being bitten by an insect. Communicable diseases may be classified according to the causative agent, the clinical illness caused, or the means of transmission. Often all three characteristics are used (e.g., food-borne Salmonella gastroenteritis). Causative agents include bacteria, viruses, and parasites. Examples of bacterial diseases include pneumococcal pneumonia and gonorrhea. Viral diseases include influenza, measles, and ebola. Parasitic diseases include malaria and schistosomiasis. Other communicable diseases may be caused by other types of microorganisms such as fungi (e.g., histoplasmosis). The types of illness include pneumonia, diarrhea, meningitis, or other clinical syndromes. Communicable diseases affect both individuals and communities, so control efforts may be directed at both. Treatment of persons with communicable diseases with antibiotics typically kills the agent and renders them noninfectious. Thus, treatment is also prevention. A simple way to prevent the occurrence of communicable diseases is to eliminate the infectious agent through, for example, cooking food, washing hands, and sterilizing surgical instruments between uses. Assuring the safety of drinking water through filtration and chlorination and treating sewage appropriately are other important means of preventing the spread of communicable diseases. Drug delivery is a method to deliver a drug pharmaceutical and other xenobiotics in the body to acheive a therapeutic effect. The main issues of drug delivery is pharmacodynamics and pharmacokinetics. Drug delivery is often approached via a drug's chemical formulation, but it may also involve medical devices or drug-device combination products. Drug delivery is mainly integrated with dosage form and route of administration. It is the science concerned with the study of the factors determining and influencing the frequency and distribution of disease, injury, and other health-related events and their causes in a defined human population for the purpose of establishing programs to prevent and control their development and spread. Major areas of epidemiological study include disease etiology, transmission, disease surveillance, forensic epidemiology and screening, bio-monitoring, and comparisons of treatment effects such as in clinical trials. Basic epidemiologic methods tend to rely on careful observation and use of valid comparison groups to assess whether what was observed, such as the number of cases of disease in a particular area during a particular time period or the frequency of an exposure among persons with disease, differs from what might be expected. However, epidemiology also draws on methods from other scientific fields, including biostatistics and informatics, with biologic, economic, social, and behavioral sciences. Illness is a condition of being unhealthy in one’s body or mind. It is a specific condition that prevents your body or mind from working normally. It is categorized as a state if ill-health, sickness or disease. Illness does not define a specific pathology, but refers to a person’s subjective experience of it, such as discomfort, tiredness, or general malaise. The way a patient reports symptoms is influenced by his or her cultural background. Disease best refers to an abnormal condition affecting an organism. This abnormal condition could be due to infection, degeneration of tissue, injury/trauma, toxic exposure, development of cancer, etc. This is what needs to be ‘cured’, especially if it’s life-threatening. A clinical trial which is a particular computer simulation and used in the development or regulatory evaluation of a medicinal product, device, or intervention is called as an In silico clinical trial. The behaviour of the drug or device reaction, when deployed in the general population or when used in particular circumstances can be predicted with the help of latest computer modelling. This process is helpful to protect the public from the unintended consequences of side effects and drug interactions. In silico trials may potentially protect public health, advance personalized treatment, and be executed quickly and for a fraction of the cost of a full scale live trial. In silico trials using advanced biological networks, or the organs on a chip technique would enable analysing on hundreds of thousands of drug candidates on billions of virtual human physiological models in seconds with supercomputers. It would make drug discovery faster than ever. • Prescription-only medicines: Prescription-only medicines need a prescription issued by a GP or another suitably qualified healthcare professional. • Pharmacy medicines: Pharmacy medicines are available from a pharmacy without a prescription, but under the supervision of a pharmacist. • General sales list medicines: General sales list medicines can be bought from pharmacies, supermarkets and other retail outlets without the supervision of a pharmacist. These are sometimes referred to as over-the-counter medicines. Journal of Bioanalysis & Biomedicine, Archives of Medicine, Journal of Cancer Medicine and Anti-Cancer Drugs, Biology and Medicine, General Medicine: Open Access, The New England Journal of Medicine, The American Journal of Medicine and BMC Medicine. Therapeutic drug monitoring (TDM) is a branch of clinical chemistry and clinical pharmacology that specializes in the measurement of medication concentrations in blood. Its main focus is on drugs with a narrow therapeutic range, i.e. drugs that can easily be under- or overdosed. In other words, TDM refers to the individualization of drug dosage by maintaining plasma or blood drug concentrations within a targeted therapeutic range or window. The basic assumptions underlying therapeutic drug monitoring are that drug metabolism varies from patient to patient and that the plasma level of a drug is more closely related to the drug's therapeutic effect or toxicity than is the dosage. By combining the knowledge of pharmaceutics, pharmacokinetics and pharmacodynamics, TDM enables the assessment of the efficacy and safety of a particular medication in a variety of clinical settings. A patient is any recipient of health care services. The patient is most often ill or injured and in need of treatment by an advanced practice registered nurse, physiotherapist, physician, physician assistant, psychologist, podiatrist, veterinarian, or other health care provider. Because of concerns such as dignity, human rights and political correctness, the term "patient" is not always used to refer to a person receiving health care. Other terms that are sometimes used include health consumer, health care consumer or client. Public health promotes and protects the health of people and the communities where they live, learn, work and play. The focus of public health intervention is to improve health and quality of life through prevention and treatment of disease and other physical and mental health conditions. This is done through surveillance of cases and health indicators, and through promotion of healthy behaviors. The World Health Organization (WHO) is the international agency that coordinates and acts on global public health issues. From conducting scientific research to educating about health, people in the field of public health work to assure the conditions in which people can be healthy. Today, public health encompasses areas as wide ranging as epigenetics, chronic disease, the science of aging, mental health, disaster response, refugee health, injury prevention and tobacco control. International Journal of Public Health and Safety, Journal of Community & Public Health Nursing, Journal of Tropical Diseases & Public Health, Public Health, Journal of Public Health and BMC Public Health. Symptom is a phenomenon that arises from and accompanies a particular disease or disorder and serves as an indication of it. Some symptoms occur in a wide range of disease processes, whereas other symptoms are fairly specific for a narrow range of illnesses. A symptom can more simply be defined as any feature which is noticed by the patient. Symptoms may be briefly acute or a more prolonged but acute or chronic, relapsing or remitting. Asymptomatic conditions also exist. Primary symptoms are symptoms that are intrinsically associated with a disease. Secondary symptoms are a consequence of illness and disease. Causes: The origins of all diseases (acute and chronic) can be traced back to seven basic causative factors. Many diseases are possible because of the infinite variety of ways these factors can come together over a lifetime and the immense genetic diversity of the each individual. The seven basic causative factors are: Nutritional stress, Emotional stress, Toxins, Physical stress, Free Radicals/ Inflammation, Radiation and Microbes. Treatment is the care and management of a patient to combat, ameliorate, or prevent a disease, disorder, or injury. It is a method of combating, ameliorating, or preventing a disease, disorder, or injury. Active or curative treatment is designed to cure; palliative treatment is directed to relieve pain and distress; prophylactic treatment is for the prevention of a disease or disorder; causal treatment focuses on the cause of a disorder; conservative treatment avoids radical measures and procedures; empiric treatment uses methods shown to be beneficial by experience; rational treatment is based on a knowledge of a disease process and the action of the measures used. Treatment may be pharmacologic, using drugs; surgical, involving operative procedures; or supportive, building the patient's strength. It may be specific for the disorder, or symptomatic to relieve symptoms without affecting a cure. Journal of Clinical Medicine and Therapeutics, Acute and Chronic Disease Reports, Journal of Infectious Diseases & Therapy, Clinical Infectious Diseases, Journal of Clinical Infectious Diseases and Practice, Infectious Diseases: Research and Treatment and Current Treatment Options in Infectious Diseases. Journal of Clinical Trials, Journal of Cancer Clinical Trials, Journal of Developing Drugs, Clinical Trials, Contemporary Clinical Trials, Open Access Journal of Clinical Trials and International Journal Of Clinical Trials.